Sunday’s game was very difficult for the fanbase as they’re wasn’t anything to root for or get jacked up while watching. We all thought the season ending Philly game was like watching paint dry, but this was a close second. Naturally, we as fans are looking for wins and don’t care for lame excuses. But there are a few trends that I’m seeing and we have to look closely at them and keep a sharp eye on these things on a game by game basis. First, in looking ahead to the Carolina game, I felt we had the edge with a better QB & RB offensively. Both were virtually shut down. My apologies, as I was wrong in at least one of those assessments. Cam was great in running the ball early, but never hurt us thru the air. Let’s look at this in context of what’s been trending. It’s not a secret that as Zeke goes, the Cowboys go. Without him, we were relatively easily defeated last season. What Carolina did was focus almost solely on stopping Zeke early in the game and forcing the Boys to pass. Obviously, we’re without Travis at center and a rookie LG. We’ve seen teams use this same approach, quite a bit in 2016 and it didn’t work. Fast forward to 2017 and the offense had less rhythm and teams were able to keep Dallas behind the chains often enough, with or without Zeke. Defenses forced Dak to beat them thru the air and they worked to limit him getting outside the pocket. The boots and waggles weren’t there as in 2016. Putting on the old D Coordinator hat, I’d be doing the same exact thing. In the NFL your QB has to be able to make all the throws. 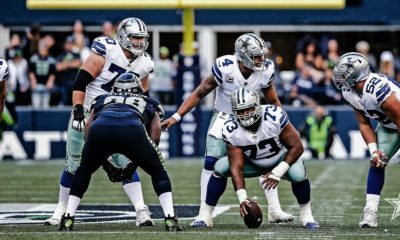 That defensive approach, a staple for really any NFL game is giving the Cowboys offense fits and Dak’s struggling to beat it. 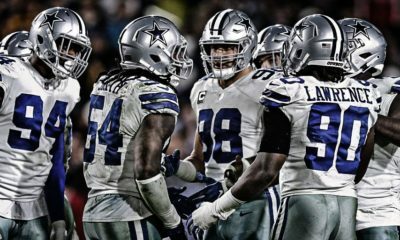 We’re going to continue to see this defensive approach until we can prove that its not the answer to beating the Cowboys. 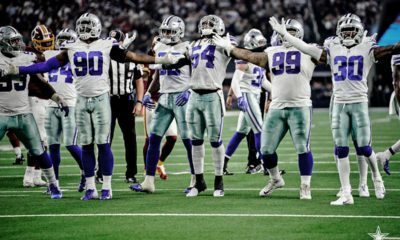 Until Dak can become a QB that makes the defense pay, we’re going to see this. Expect man coverage by the Giants and Landon Collins in the box, down after down on Sunday. The best way to get out of this trend may be to start up tempo and passing first and setting up the run, instead of the other way around. We have to mix it up. Wouldn’t hurt to get Zeke more involved in the passing game. The guy filling in for La’veon Bell had more receptions in one game than Zeke’s had in any single game or at least that’s how it appeared. We seam to feel we can impose our will and that’s just not working lately. We’re without Travis right now and trying to roll with Connor at LG as a rookie. I totally expected the rookie to lose a few plays to Short and that happened. For a collegiate tackle to convert to a guard in a matter of months will have a learning curve, so sit tight. Williams is going to be a good one, he’s got great feet, he’ll get much stronger next off season & his athleticism will enable our offense to do some special things. Our two guards pulling, will be real sweet! What we have to come to grips with is that Dak isn’t at his best as a pocket passer. It’s been obvious that he doesn’t like to go vertical and he doesn’t like to hit guys on the move or can’t do it easily. Most disturbing is that he doesn’t either see his guys come open, or doesn’t want to take the slightest risk. Frankly, I think its both and its wearing on him and us. In watching Cousins in the MN game, Brady & Rodgers, each of them hit their WR’s in stride and they’re able to continue for the YAC (yards after catch). My brother, tried to say that Dak has almost all new receivers, to which I agreed. But I asked him if Cousins had worked with any of his WR’s in MN before OTA’s and training camp this year? New teammates, new coaches and there was Cousins hitting his guys in stride, play after play. Even Sam Darnold, the rookie for the Jets was pretty good in that regard. I know, it was Detroit, I get that! Dak seems to want to hit his guys in place, as though he’s playing pitch and catch. As though he waits for his guys to sit down in the zone coverage. We signed Thompson to go deep and not a single attempt to go downfield. It’s ok to take a shot, overthrow them if you don’t like the play, but darn, stretch them out. We signed Tavon Austin and what did he get, one ball? I’m concerned that defensive coordinators have Dak figured out. Did you notice that Dak would drop back on 3 step drops and then get trapped when he didn’t get the ball out quickly? Defenders were in his grill and he was having to pull it down and run for his life. Frankly, I was yelling at my TV screen, “Dak, move your feet”! Why didn’t he take 2 steps back to reset himself and gain room to continue looking the field over? It was reported that he got an average of 3.5 seconds in the pocket on his drop backs. Its really looking like he’s late in what he sees or should see. I’m not happy to look at him this way, but to be fair to you, I feel I have to write what I’m seeing. That being said, I don’t know the play call, the primary or secondary receivers or their route tree on a given play. I know its only one game, but if you go back into the last part of last season, this has the makings of a trend. Why is it a trend? To me, Dak is not a pure pocket passer and hasn’t grown into that skill set. Now, Scott Linehan took a lot of heat after the game. When you look at different things that occurred in this game, I don’t really put much on him. We all want plays that work, then we’re all fat and happy. When you watch Dak drop back and not make the throws when he has a guy open, you yell or at least scratch your head. Where I think Linehan has to make a small change and go back to 2016 and that is more run options with Dak getting on the edge. At the very least it keeps the DE’s from crashing inside on Zeke. We’re not fond of risking injury to Dak, but its part of what made him successful in college and at times in ’16 & ’17. If they do that a few times, then the lineman have to stay in position, the linebackers and even the safeties, for that split second. Run a few of those, as Cam did to us, it might open things up for Zeke and if you slow down those LB’s for a tick, then the windows can open for Dak enough for him to cut the ball loose, hopefully. I’m not looking to put it all on Dak, but when you watch a young whipper snapper like Darnold making all the throws and seeing the field as he did, albeit one game, we have to question whether or not Dak is the franchise QB they think or thought he was. Naturally, we’ve been thinking he is, based on his 2016 performance, but the trend is not pointing up of late. It’s up to Dak to change what I believe I’m seeing the last half dozen games or so. 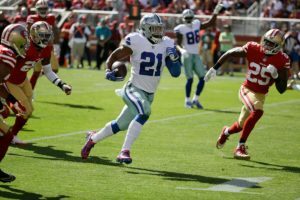 I wanted to chalk it up to the chaos brought on by Zeke’s suspension, then the games missed by Tyrun, which were tough to watch. But now, I’m not so sure if he’s the player we need. 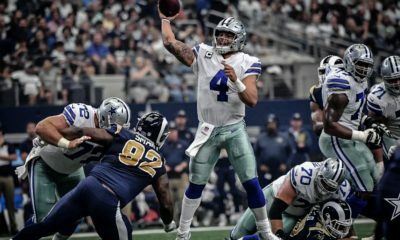 This is supposed to be the season leading up to an extension for Dak, but now its time he shows us that the team offensively is regaining its footing. We expected last season to be rock solid, but for reasons mentioned, I gave him a bit of a pass. But now, I’m wondering if he’s improved in areas that I saw weaknesses in before, with his strengths overcoming those. We released Dez for a variety of reasons, most of which we’ll never fully know. One was that the two weren’t a match made on the gridiron. 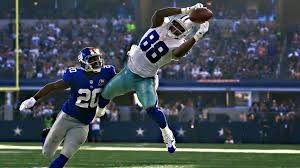 Dez was too undisciplined of a route runner to play to Dak’s skill set, is what we heard. Also, that Dez as any good WR would tell you, they just want the ball. 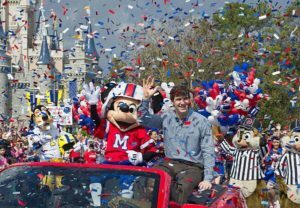 Many thought that it was wearing on Dak and they wanted that Dak friendly environment. 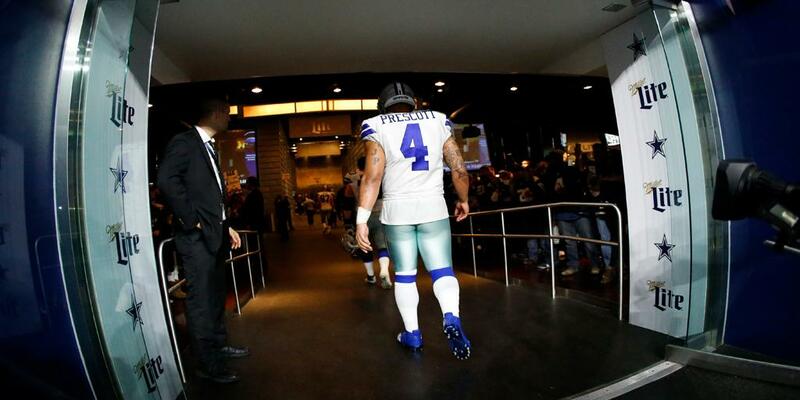 Whatever it was and whatever it will be, is now on Dak’s shoulders to get it together. 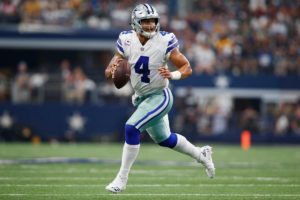 Dak’s a really good leader and his athleticism has saved our bacon in games, but he has to know where to go with the ball and just let it rip! I’m hoping that things can return to form, so lets hope for the best. We want a successful season this year, minimally one to build on with so many new coaches, new players, loss of players by releasing them or retirement that caught us all by surprise. This is a big game for both teams and I’m expecting a tough NFC East type match up. The one major hope we have in this game is that they have Eli, who as many of you may know, I think very little of as a QB. Two great runs of six and eight game in ’07 & ’11 doesn’t make a great QB. A little pressure, move him off his spot and he’ll throw a few our way. Can we catch them? My belief is that they’re putting together a solid defense that can keep us in most games. While we only gave up 16 points last week, I’m aware that the fumble inside our five yard line, kept the game from getting out of hand. One which, Cam was unimpressive as was their offense in general. If we have a plus two in turnovers, we can win this game. If not, I’m going with the trend and bracing for another defeat at the hands of our the wretched Giants. A loss to them is brutal as I’ll have to take abuse from my brother in law and I don’t want that! This is a huge game for both teams! When you play only 16 of these, they’re all must win games. Likely you’ve heard of the stats on teams losing the first two games and still making the playoffs. One team in this matchup will be in pretty serious trouble. Should my Boys rise up, it will be the defense leading the charge and my favorite target, Eli throwing us a few gifts!